The Best Beachfront Villas for the Whole Family! Has a beachfront family vacation always been a dream of yours? Make it a reality! WIMCO has selected some of the best family villas on the beach that the whole family will love. Each villa selected provides privacy and seclusion for quality family time while basking under the tropical sun. 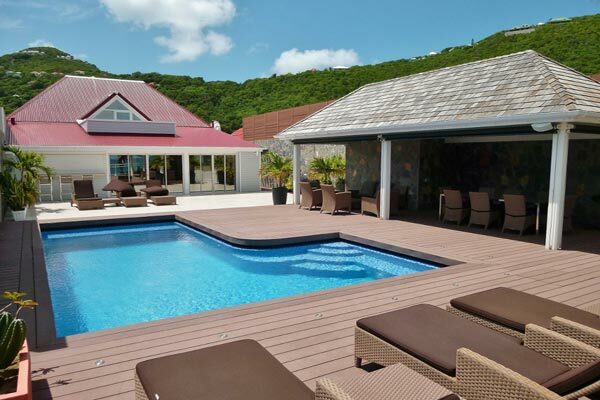 Recently renovated, Villa WV MLI is located right on the sandy shore of Flamands Beach in St. Barths. Located on the main level are two bedrooms, perfect for the kids. A third bedroom is located on a higher level with a private ocean-view terrace where you and your loved one can cuddle while gazing at the stars or bring the kids up to watch the c olorful sunset over the horizon. Watch the kids play in the turquoise L-shaped pool while tanning on the large wooden deck. Enjoy a family lunch under the large gazebo located by the pool then head out to the beach to build sandcastles with the white warm sand. Included with your reservation is a round-trip sail on a 42’ foot yacht from St. Barts to Pinel Island for the whole family! Take in the breathtaking views of the ocean while the kids scan the bright blue waters for marine life. Villa RIC SAN is an absolutely stunning Tuscan-inspired villa located on a secluded beach on the North Shore of Anguilla. You can rent up to 4 bedrooms in this villa, enough room for the whole family. The large Grand master bedroom is a dream in itself. Enjoy a rejuvenating workout session in the ensuite fitness room. Rinse off in the private outdoor shower or soak in a bubble bath in the ensuite bathroom. Grill a delicious barbequed meal for the kids under the outdoor gazebo with the sounds of the waves crashing. With infinity pool that blends with the shades of the blue ocean, your children will believe they are venturing beyond the pool and into the sea. Venture onto the secluded beach with the children to sink your toes in the sand and let the water wash up on your feet. In the evening, the children can cool of in the media room with a computer area while waiting for dinner to be served. All of the rooms include soft Egyptian cotton sheets and are beautifully decorated for your beach vacation. Located on Fitts Villa Beach in Barbados, this coral colored 4 bedroom villa gives off the vibe of the ‘laid-back’ Caribbean lifestyle. The pool is surrounded by large palm trees and luscious green plants. Enjoy fresh lemonade with the whole family on the wooden deck overlooking the beach and ocean. The whole family can gather at the outdoor table for a dinner shared with laughter and memories. Leave the cooking and cleaning to the on site staff for an easy family vacation. The whole family will feel extra secure with the villa’s own nighttime watchman. Villa BS NIR is decorated with light and cheerful colors that are sure to please the whole family.